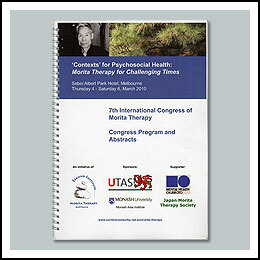 The 7th International congress of Morita Therapy was held in the Sebel Albert Park Hotel in Melbourne,Australia in March, 2010. The chair of the congress was Dr. Peg LeVine (Monash University, Mebourne). 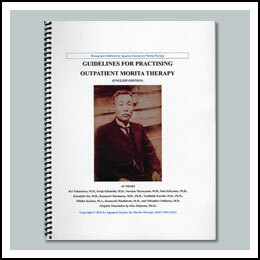 These guideline were developed in 2009 by the following members of the Commitee on the Standardization of Outpatient Morita Therapy for the japanese Society for Morita Therapy. Neurosis is divided roughly into three categories, i.e., ordinary neurosis, obsessive-compulsive neurosis, and anxiety neurosis. Here are descriptions of these catagories and psychiatric explanations of the symptoms of neurosis. What types of persons are predisposed to neurosis? A fair knowledge of your personality characteristics will help you judge whether you are susceptible to neurosis or not. What is the well-recognized psychotherapy called Morita Therapy? Extracts from the books written by Dr. Shoma Morita who founded Morita Therapy deal with the psychogenesis of neurosis, its substance, and the basic therapeutic principles. Here are success stories by patients with gastrointestinal neurosis, headache/insomnia, anthropophobia, ereuthophobia, anxiety neurosis, and others helped by Morita Therapy. This Society acts to promote scientific studies of Morita Therapy in psychiatry and to publish bulletins dealing with reports of studies on Morita Therapy, case studies, its activities, etc., in order to contribute to the spread of Morita Therapy and the studies related to it. This is a spot for quickly providing the newest information on topics related to Morita Therapy. Timely information will be presented about upcoming television programs and public seminars. Here you can link to other home pages for information on Morita Therapy or the medical facilities which carry out Morita Therapy. Pages link to the Society for Morita Therapy and other medical facilities in the respective areas which form the core of medical study. The Mental Health Okamoto Memorial Foundation, inc.
What is The Mental Health Okamoto Memorial Foundation? Here is an introduction to the Foundation sponsoring and managing this home page. Its activities, its library, and information on seminars, overseas activities, and other topics are described. You want to be friendly, but you avoid others. You worry that you tend to blush in public. You worry that your heart will stop beating. You can't feel at ease without checking and rechecking things. Recently you cannot work well. You are afflicted with insomnia. Noises distract you from your work. You overly seek medical advice about possible illness You suffer from strange sexual ideas. You are troubled by the gaze of others. You are worried about your facial expression. You feel heaviness, pain, or lightness in your head. You feel oppressed by dizziness. You feel inferior to others. You worry about psychogenic diarrhea or constipation. You worry excessively about dirtiness. You are worried that you might have done something wrong. Your body feels vaguely strange. Your hand trembles when writing something important.